This Product has been discontinued. 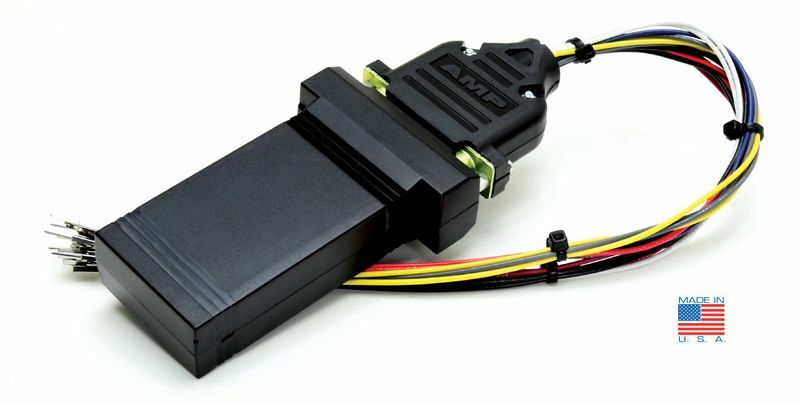 For similar functionality please see our listing for the Burger Motorsport Pedal Tuner. How about up to 60hp to the wheels (80hp crank) on a completely stock car on pump gas? Finally, thanks to Burger Motorsports there is a tuner available for the N51/N52/N53 motor (128i, 328i etc. See below for a full list of applications). 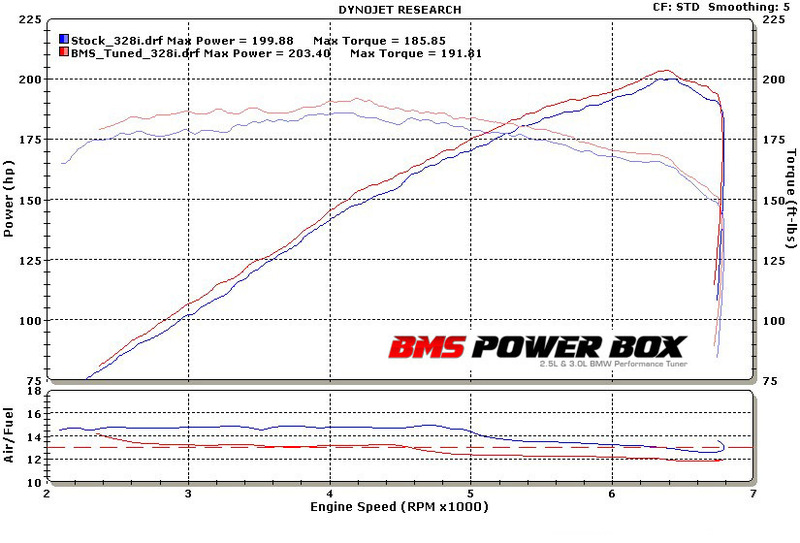 The BMS Power Box remaps the throttle mapping for better throttle response, and an increase in horsepower and torque. The Power Box features easy installation and removal, and gas pedal switching between 7 performance maps. The Power Box shows power gains from 8-10 horsepower and 8-10 Ft./Lbs. of torque at the rear wheels on a dyno. 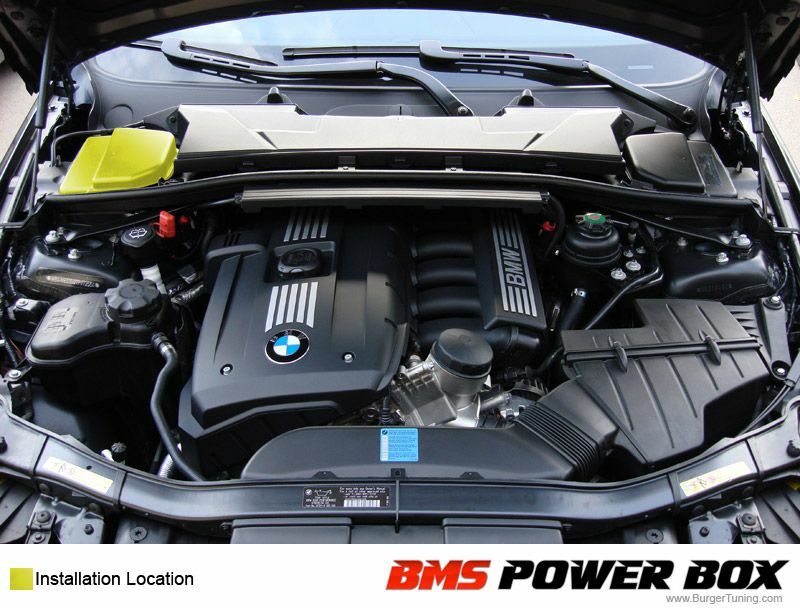 Upgrade your vehicle's power and drivability with the BMS Power Box. The BMS Power Box is purely plug and play and installation only takes roughly 20 minutes, and only requires basic hand tools. It is completely reversible, and no cutting of any wires is needed. Installation is very discreet and allows most customers to leave the Power Box installed for routine service. Insert the keyfob and press the start button to turn the ignition on (lights on the dash but the engine is not running). Press and hold the gas pedal down to the floor for 4 seconds or more, then release. This puts the Power Box into listen mode. If you start the engine at this point you will be on map 0. For performance maps press the gas pedal to the floor and quicly release one time for each map you would like to select. For example, for map 3 press and release the gas 3 times, then start the engine. Your map setting will be saved until it is changed. Okay let me start off by saying, it WORKS. I have a 2011 128i and the performance on it now is outstanding. Before i could beat cars, but now its not even funny. I use MAP 2 on D and it feels like S. when it is on S it is amazing. If you want a first mod on your car, get this one. you WILL notice it. Overall I would remcommend this. its a great product for the price, and is also very easy to install. It is the first mod I put in my little baby, GET IT!! When I told Alan I was looking to increase horsepower he recommended a few products. I chose the BMS powerbox as a starter because of a review I read here on modbargainas. I had similar complaints as that driver and as it did for him it did for me. It has definitely changed the way the car feels. It feels more nimble and especially quicker on sprints. Using the steptronic manual option is now actually fun it reacts quicker revving much faster. It used to react so slow I hated driving it on manual mode but now it is my favorite. It really changes the way the vehicle responds. I have only driven sports mode once and it felt slightly faster at times, it also felt jerkier when slowing down and then speeding up it felt like it just wanted to explode away which is a nice feeling to have when your behind the wheel knowing you could just take off at any moment. As for installation it is not that simple but easy enough I recommend doing it with another person. I had a mechanic get through the engine parts and then my father and I took care of all of the wiring which took us about a half an hour to do. All together it was about a 45 minute to an hour job but we had the mechanic take apart the few parts in the car and then put them back together. Really though the wiring is the tough part so if you know your way around the engine you would not even need a mechanic to do this but I did. My final take on this product is that it is a fantastic mod, I am not sure just how much horsepower it added 8, 10 but it sure makes driving more fun. I feel more of a kick when I step on the pedal and the car feels more responsive which is awesome. To sum it up it feels a bit more like the 335i which if you have driven one you can imagine what I mean. I bought a used '07 328Xi with an automatic transmission. It was my first auto transmission in two decades. I bought the car because it seemed like a really good deal. My main complaints about the 328Xi were acceleration lag, particularly when trying to accelerate out of corners, or when I had just braked hard, changed lanes, and was trying to get back up to speed with traffic coming down on me fast. I thought this was due more to the auto transmission and the all-wheel drive (giving the computers too much to think about). The BMS (Burger Motor Sports) Powerbox has fixed this issue. I bought it through Alan at www.ModBargains.com after the Thanksgiving sale. I've only driven the car about 10 miles today after doing the install, but I noticed a huge difference, even though I was driving in D mode. Tomorrow I'll check out S mode. Today, the car was very responsive right from the start. It's a great mod. I've left it in the default mode 3, which is 100% throttle re-mapping with performance tuning. Removing the top from the ECU box was also difficult. I was trying so hard not to break anything. Once I got the connectors out, however, connecting the wiring was pretty easy. Just make sure you do one wire at a time. The ECU box is packed with wires and stuff, and it's very frustrating trying to work in that limited space, but I took my time and got it all done correctly. Here's a tip, when working with the small ECU connector: don't push the slider all the way in! It locks down, and you have to push a pin on each side of the connector to get the slider back out. You have to repeat that process to get the slider off. It was a real pain. There was nothing to unlock when you take the small connector off of the box, so it made no sense that it does lock when it's off the box. Also, you need a small flat blade screwdriver, but for some tasks (unlocking sliders and wires) it's better to have a small pointed tool, like an ice pick or the awl on a SAK. Anyway, total installation time (including a search all over the garage for my socket wrench) took two times through a White Stripes CD and partway through a Clap Your Hands Say Yeah CD. I was very relieved to start my car and see no CEL and hear no sputtering. You couldn't tell there was any difference until you mashed the accelerator and took off. The car is all back together and runs great. I had bought into the notion that there is no point spending money on mods for a 328xi, because you should just save your money and trade up to a 335. But, I'm very satisfied with this low cost mod that addressed the very complaint that has bugged me from the second day I owned this car. After a few weeks, I'll post any new impressions that may form. One other tip: if it's been a long time since you changed the air filter for the cabin HVAC system, go ahead and get yourself a new filter before you start the install. At a minimum you can do what I did, which was to beat the existing filter against a brick wall to shake out a ton of dust. ETA: drove it again tonight. Backing out of my parking space later, I forgot about the extra pep. Being used to the laggy acceleration, I was pretty close to the car next to me. After backing, I started to turn the wheel expecting a slow crawl forward to clear my bumper from the next car, and the car leapt forward passing my front corner a lot closer to the next car than I wanted. Next time, I'll remember the new throttle mapping.